Max Verstappen owned up to his mistake after a crash in the Chinese Grand Prix with Sebastian Vettel cost him dearly. 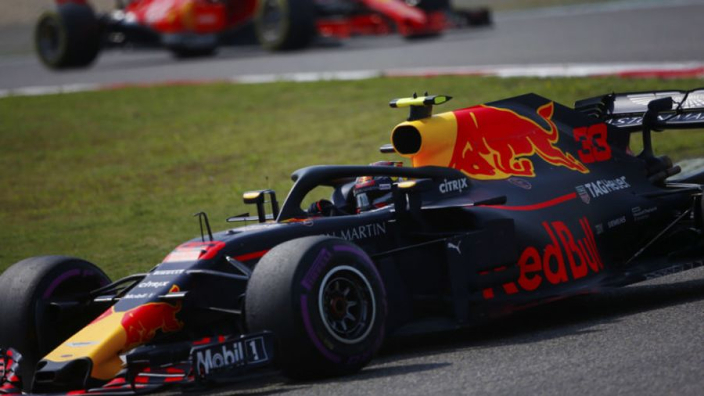 A pair of overenthusiastic attempts to make up places on track left Verstappen fifth, while his team-mate Daniel Ricciardo took an impressive victory in Shanghai. Red Bull pulled off a masterstroke under the safety car to pit Verstappen and Ricciardo at the same time for fresher soft tyres, while the Mercedes and Ferraris around them ran on worn medium compounds. Verstappen was ahead of Ricciardo at the time, but he lost position after going off the track while trying to overtake Lewis Hamilton around the outside before clipping Vettel to send both cars into a costly spin. Vettel went on to finish down in eighth, while Verstappen was classified fifth after a 10-second penalty was applied and the Dutchman was contrite after the race, having seen his race in Bahrain a week earlier ended in similar circumstances. "I could see him struggling on the tyres and tried to brake late into the corner. I locked the rears a bit and hit him. That was of course my fault," said Verstappen. "It's not what you want and it's easy to say afterwards I should have waited. "That probably would have been the best idea but unfortunately that happened." Vettel and Verstappen were pictured in conversation in the pit-lane after the race and the championship leader revealed that the Red Bull man had approached him to apologise. "I think he got it. He was quite composed and realised that he messed up." Seemingly most frustrated with the incident was Red Bull advisor Dr Helmut Marko, however, who conceded his star man had given up the victory which came to his team regardless. "Max overdid it by trying to overtake Vettel," Marko told Movistar. "It was a mistake from him. "He apologised. That can happen in racing. His time will come. He just shouldn't overdo it. He knows what he lost. "There was a victory for him on the table, but he gave it away. "But still it was a very good drive from both our drivers. He 19 or 20, he's bloody young, and it can happen."